The Himalayan mountain chain is 1,500 miles long, so a huge variety of landscapes, cultures, and experiences can be found here. India alone offers several very different Himalayan destinations, from high-altitude deserts to the jungle-strewn foothills. Then, of course, you have Nepal—home of seven of the world's ten highest mountains, and one of the most ethnically diverse countries on the planet—and the isolated Kingdom of Bhutan, which follows Tibetan Buddhism. One could spend a lifetime exploring the different corners of the Himalaya and never get bored, no matter your interests or fitness level. If you're looking for a handy guide to help you narrow down your options, read on. This geographically small country is the Himalaya to many travelers. With well-trodden as well as remote trekking trails, a wide variety of accommodation, diverse cultures, many different adventure activities plus cultural touring options, Nepal is a one-stop Himalayan shop. Who is Nepal best for? Beginner trekkers: Not all trekking trails in Nepal are extremely hard, or go to very high altitudes. The three-day Balthali Village trek is on the edge of the Kathmandu Valley, and stays at lower altitude. The seven-day Pikey Peak trek is a great option for travelers wanting to see Everest without the exertion of Everest Base Camp. Check out this article on the Best Beginner Treks in Nepal from 3-8 Days for more ideas. Family travelers: Some trekking trails and day hikes are ideal for families, such as the day-long Sanga to Panauti hike or trails within the Shivapuri Forest in the Kathmandu Valley. Plus, there are non-trekking activities to entice kids, such as jungle safaris and white-water rafting. For more information on traveling in Nepal with kids, read Kimkim's guide to Trekking With Your Family in Nepal. 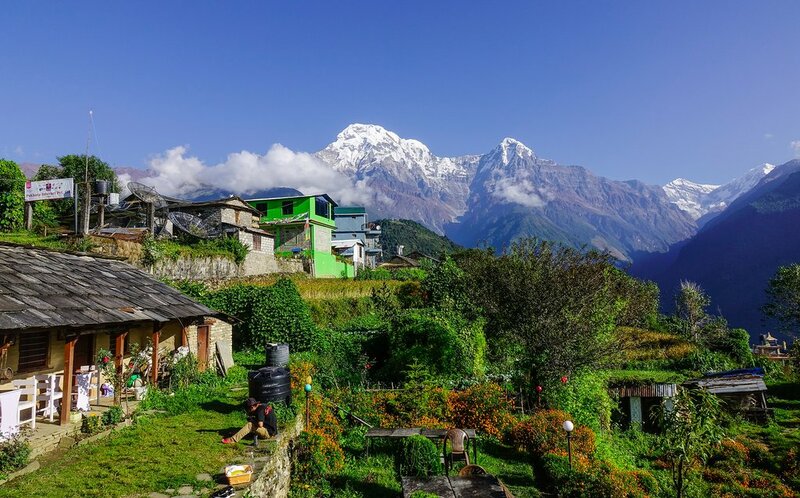 Experienced trekkers: For travelers with plenty of hiking and trekking experience, some of the more remote treks in Nepal offer an unforgettable challenge. The 22-day Three Passes Trek includes some of the Everest Base Camp route as well as three 16,000-foot-plus mountain passes (read more about it here). The 27-day Upper Dolpo Trek takes travelers into one of the most remote parts of the Himalaya, and few people make this trip every year (find out more in this article). The 21-day Dhaulagiri Circuit Trek is considered to be one of the hardest treks in Nepal, as it requires camping above 13,000 feet (check out this article on the Dhaulagiri Circuit). Mountain climbers: Of course there's the famous Mount Everest, but there are many other rewarding peaks without the human traffic jams, plus 'trekking peaks' that don't require a pricey mountaineering permit. Mera Peak is Nepal's highest trekking peak, at 21,246 feet, and there are views of Cho Oyu, Everest, and Makalu from the summit. Island Peak (20,305 feet) is Nepal's most popular trekking peak, and the trek there follows much of the Everest Base Camp route. Non-trekkers: You don't have to be gung-ho about outdoor pursuits to enjoy Nepal. Kathmandu and Pokhara offer a wealth of sightseeing options, from sunrise viewpoints to ancient religious sites. Check out this 5-day Kathmandu and Pokhara sightseeing itinerary for some suggestions on what to do. Smaller towns like Bandipur, Panauti, and Namo Buddha are also worth visiting for their ancient culture, traditional architecture, and rural lifestyles. Bhutan is a very different Himalayan destination, a small kingdom east of Nepal that restricts the number of tourists it receives by charging a per diem visa fee. Bhutan is not a budget travel destination, but travel there can be very good value because the fee is all-inclusive. Because of this restriction, travel in Bhutan carries an air of exclusivity, but in reality, a range of different kinds of travelers enjoy the country. Who is Bhutan best for? High-end travelers: Bhutan has some beautiful luxury accommodation options, where the hotel itself is a destination and you may have a hard time leaving to go sightseeing. Bhutan's luxury hotels are a combination of old-meets-new architecture and thoughtfully designed interiors inspired by Bhutanese design. Read our guide to The Best Luxury Hotels in Bhutan. Travelers who enjoy guided tours: While some travelers are fiercely independent and like to plan everything on their own, others enjoy sitting back and letting someone else do the planning. The latter is necessary in Bhutan, as all travelers must join a guided tour (although this can be a private tour—you don't need to join a group with strangers). Bhutanese guides are very knowledgeable about their country's culture and history, and you'll learn a lot from taking a guided tour in Bhutan. Check out this Highlights of Bhutan 5-day itinerary. Travelers who enjoy gentle walks: Beginner trekkers, families, or older travelers who like to get outdoors but who don't want to do a massive trekking expedition will enjoy the walking options in Bhutan. Many tours combine sightseeing in and around the towns of Paro and Thimphu with gentle day hikes. Perhaps the most iconic attraction in Bhutan is the Tiger's Nest Monastery, perched on a cliff, and reaching it requires a few hours of moderate walking. The Gangtey Nature Trail in the Phobjikha Valley is an easy, short trek that's mostly downhill, and offers beautiful views of a glacial valley. Read up about more day hikes in Bhutan in this article. Experienced trekkers: The trekking infrastructure in Bhutan is less developed than in neighboring Nepal, meaning that camping is usually necessary on multi-day treks, but that's all part of the fun. The 27-day Snowman Trek is often called the most difficult trek in the world, as several high passes of around 16,000 feet must be crossed along the way, and it's necessary to camp above 16,400 feet more than once. The rewards are river valleys, alpine meadows, pastures, orchards, rhododendron forests, and views of Himalayan peaks in Bhutan and Tibet. For a shorter and less difficult challenge, try the 12-day Laya Gasa Trek instead. The Snowman Trek is actually an extension of the Laya Gasa Trek, so doing this shorter route gives many of the same rewards without the pain. Read about more treks in Bhutan here. The Indian areas of the Himalaya are perhaps the most geographically diverse. What they may lack in sheer height compared to Nepal (with the exception of Kanchenjunga, the third-highest mountain in the world, which sits on the Nepal-India border) they make up for in variety of landscapes and culture. There are three main areas of the Indian Himalaya: Kashmir and Ladakh (distinct areas of Jammu & Kashmir state); Himachal Pradesh and Uttarakhand, neighboring states that rise from the Himalayan foothills to the real deal; and the northeastern states, a collection of eight small states that are only connected to the rest of India by a narrow corridor. The cultures inhabiting the Indian Himalayan regions range from Islamic to Tibetan Buddhist to Hindu to animist; the landscape from high-altitude desert to lush river valley. When deciding to visit the Indian Himalaya, the location is as important as the activities and experiences, because it's not so quick or easy to travel between places as it is in Nepal or Bhutan. Some parts of the Indian Himalaya are overlooked by travelers—check out Places Most Travelers Miss (But Shouldn't) in India to find out more. This article—India's Main Regions: Where, Why, and When to Go—can also help narrow down your options. Ladakh: Ladakh is a high-altitude desert in the rainshadow of the Himalaya. It's physically and culturally Tibetan, and many people say that it's actually more Tibetan than Tibet these days. 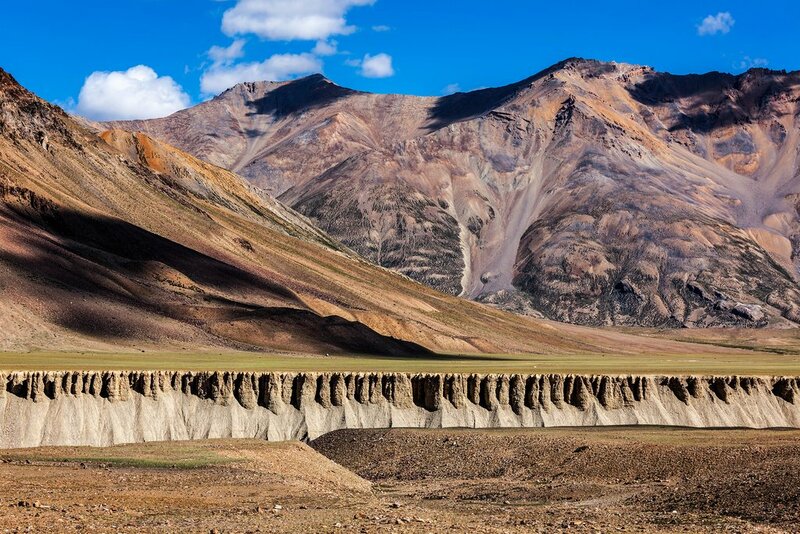 Ladakh is part of Jammu & Kashmir state but is physically and culturally very different from the rest of the state. Kashmir periodically sees political tension, which can flare up into unrest, but Ladakh is hardly ever affected. 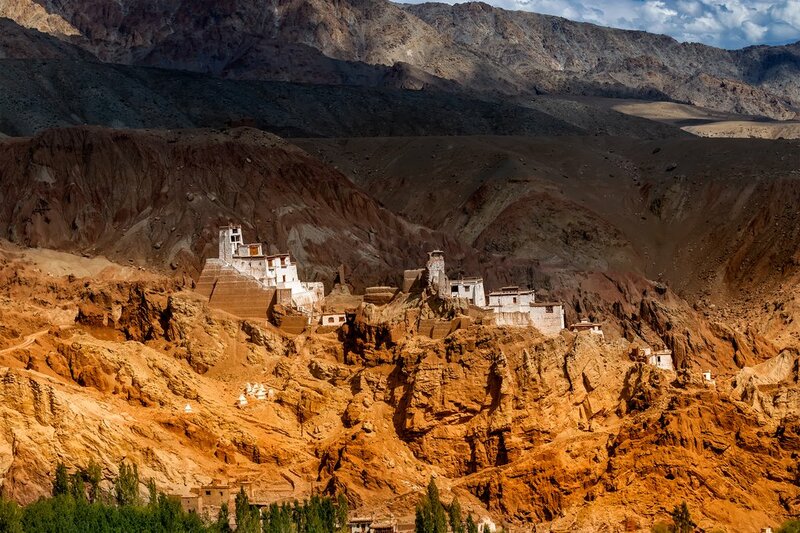 Ladakh is above 10,000 feet, so proper acclimatization is required before sightseeing or trekking there. Highlights include high-altitude lakes, working monasteries, and vast desert landscapes. Motorbiking, rafting, kayaking, and trekking are all popular activities, mainly in the summer months (June-August) when the weather is warm. Ladakh's roads are blocked by snow and ice for most of the year. This article introduces the 10 best treks in Ladakh, including the 8-day Chadar Frozen River Trek that traverses over a frozen river in -20°F temperatures. There are treks in Ladakh to suit a range of abilities and levels of experience, but it's imperative to be well acclimatized before embarking on any trek. Himachal Pradesh & Uttarakhand: These two states are more easily accessible from many other major North Indian cities (particularly Delhi), so see many more tourists. Himachal Pradesh is most famous for Shimla (the erstwhile summer capital of the Raj), Dharamsala (home of the Dalai Lama and Tibetan Government in Exile), and adventure playground Manali. Treks in Himachal Pradesh tend to be camping, and there are trails to suit all kinds of travelers. An especially interesting short trek is the Nagar to Malana trek. Malana is an unusual, isolated town where the people believe they are descendants of Alexander the Great. The lower parts of Uttarakhand are not much above sea level, but the Himalayas reach into the northern parts of the state, and it's home to Nanda Devi, the second-highest mountain in India. Yoga practitioners enjoy hanging out in Rishikesh and Haridwar (this tour spends time in both towns). There are also some great remote trekking trails. The Gangotri Glacier trek is also a pilgrimage route. The Valley of Flowers trek is as spectacular as the name would suggest, although it requires getting wet by trekking during the monsoon in order to see the flowers. The Roopkund trek is also an eerie one—the beautiful high-altitude lake is said to be haunted, with visible human skeletons. Northeastern States: Making up Indians hilly and mountainous Northeast are the seven 'sister' states of Arunachal Pradesh, Assam, Manipur, Meghalaya, Mizoram, Nagaland, and Tripura, plus a previously independent kingdom, Sikkim. 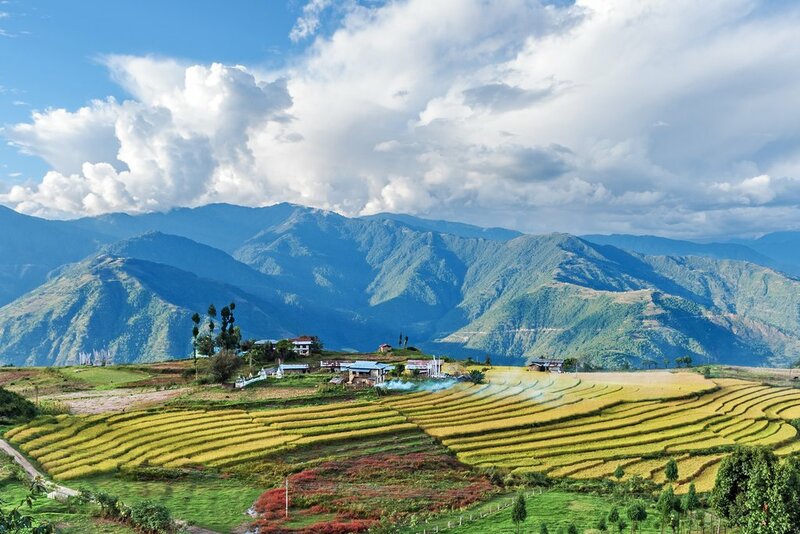 As some of the Northeast borders China and have been experiencing insurgencies for several decades, there are some limits on where foreign (as well as Indian) travelers can travel within these states. This means that there are far fewer travelers than elsewhere in India, but those who do make it there find it worth the effort. Highlights include the Buddhist monasteries of Sikkim, whitewater kayaking in Meghalaya, learning about the fiercely independent Naga people in Nagaland, and the Talle Valley jungle trek in Arunachal Pradesh.